During the month of October, we will be singing our pumpkin song at circle time and reading the Green Monster book. We will continue to sing the ball song to help us learn all our friends names! The children will also be making some fun fall crafts and special ghosts for halloween. The class will also have a fun pumpkin party, where we will eat some pumpkin cookies, hunt for our very own pumpkin and paint one too! The Three Year Olds are doing a great job making new friends and adapting to our new class schedule. During October, we will be talking about fall, leaves, pumpkins and fall animals and will be making fun crafts to go along with our discussions. The class will be doing some baking with apples, something the children always enjoy. We are all looking forward to our trip to DePiero's where we will be picking out our Class Pumpkin. The highlight of the month will be showing off our Halloween costumes and celebrating at our parties. The apple theme continues into October. The children will taste different colored apples to see which they like best and graph their results. We will read a rhyming book about Christopher Columbus and paint a mural depicting his famous journey to America. Autumn/Fall changes are observed, discussed, and used to create themed projects and skills. The children are looking forward to the pumpkin picking trip where they will enjoy a hay ride through the field, picking their own pumpkin and then having a snack of apple cider and a donut. As we carve the class pumpkin, we will incorporate science, math, and literacy lessons. Journal writing continues weekly based on themes as well as letter recognition. Halloween is always a favorite with the children. Making decorations to adorn the classroom and the school party will be fun. As a class, we will be writing a Halloween story. 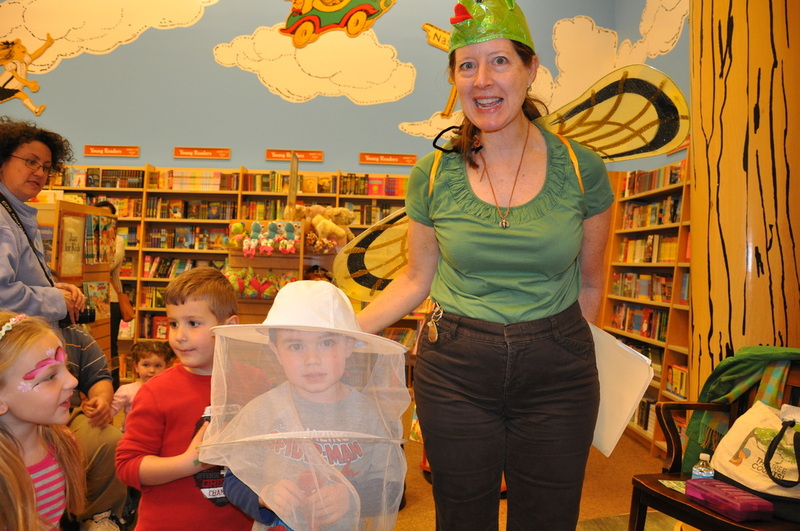 What child doesn't find spiders and bats enticing? We will discover about these interesting creatures. The Halloween parade and class party is the highlight of the month. Finally, a visit from the firefighters and exploring the fire truck, while the students learn fire safety, makes October a special month for fours. During the month of October, we will continue our learning through exciting topics revolved around the season. We began our month with an apple theme. The children have learned all about apples - how they grow, what they look like, their different parts, the different kinds, and even what they taste like! While performing our taste test, the kids used their five senses to describe their apple. We then graphed which kind we each liked best! We will have fun practicing numbers, and introducing addition, with the use of apples. Letter recognition and letter-sound association will be reinforced through new vocabulary and literature. Measurements will be introduced when we bake Apple Crisp this Friday! These ideas and concepts will follow through into each new theme. Some other themes this month will include, pumpkins, bats, Christopher Columbus, fire safety, Halloween, and spiders. The children will get to wear their costumes and enjoy lots of goodies when we wrap up the month with a spooktacular Halloween Party! The Big Board at Rockland Boulders! 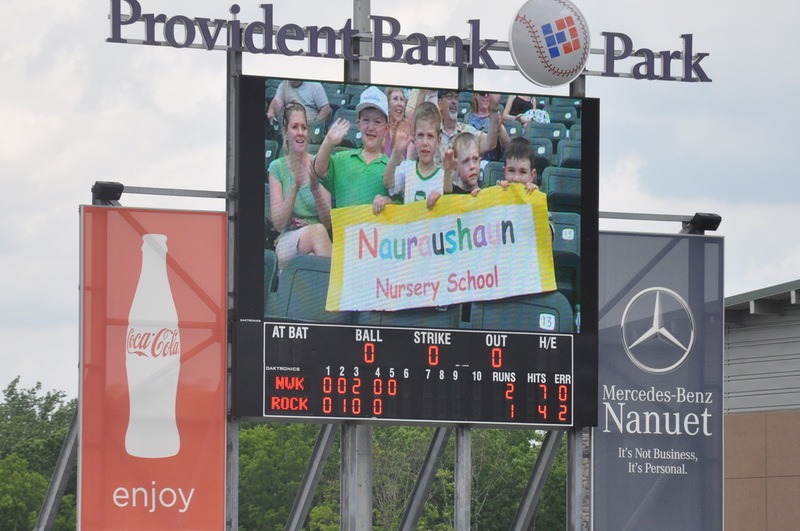 NNS Students were featured on the big board at the Rockland Boulders game on Sunday, June 2nd! 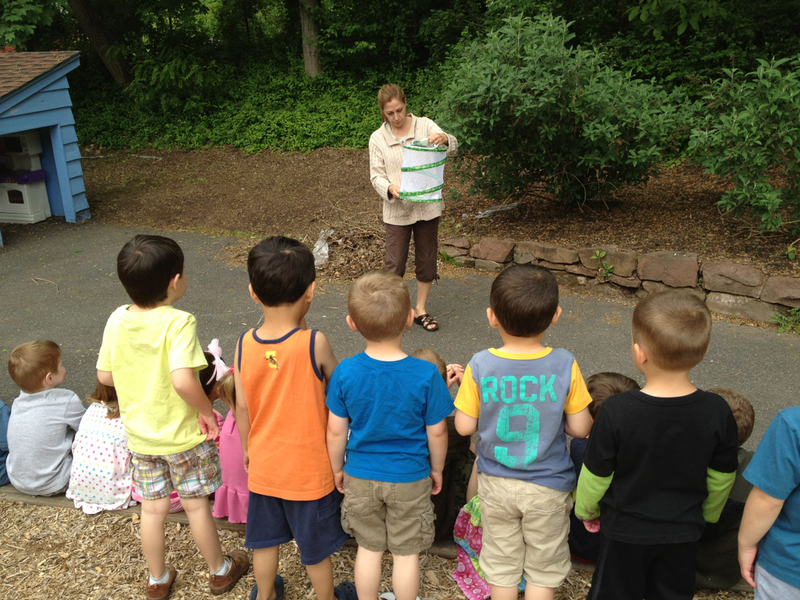 The 3&apos;s and 4&apos;s saying goodbye to the butterflies they raised from caterpillars. 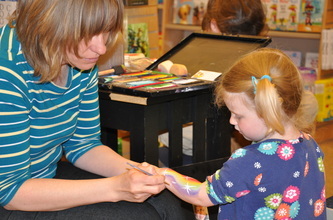 The toddlers are preparing for their Mother's Day Celebration on May 9th and 10th. 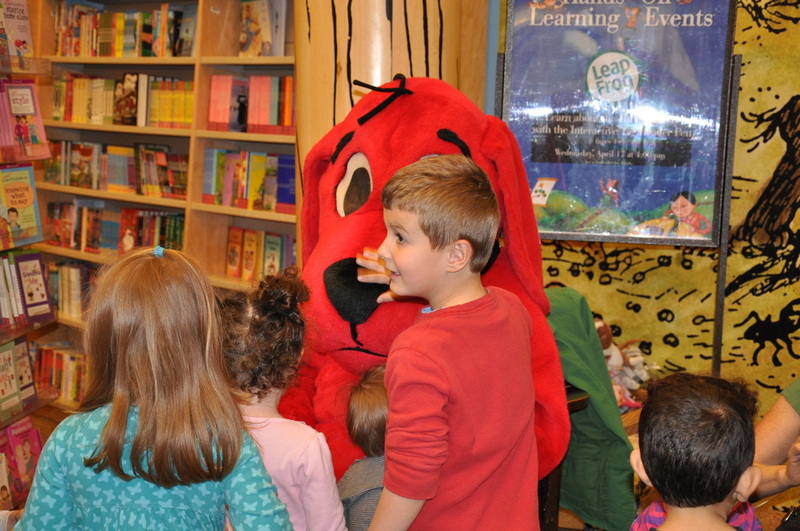 The children will sing a song, give a gift and eat a treat that they prepared for their moms! During circle time using our instruments and the felt board, we will be singing two of our favorite songs: Old Macdonald and The Wheels on the Bus. At the end of the month, our bean box will magically turn into a water table! Lots of bubble fun!! The 3's are very busy and having a great time preparing special gifts for our upcoming Mother's Day Tea. Our caterpillars have arrived and we will be following their transformation into butterflies, at which time, we will release them into the playground. It will be a nice way to end our Bug Unit. The ABC books are almost complete. The children have worked hard all year on them. 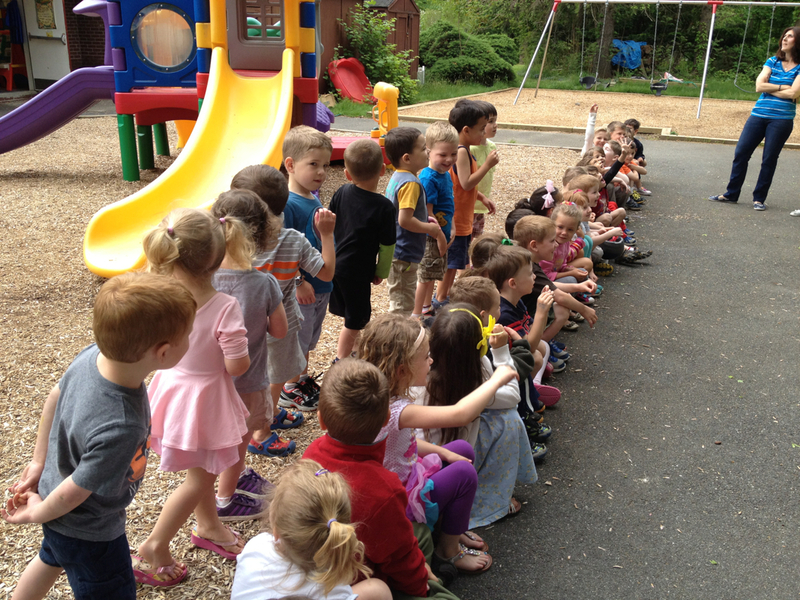 As the weather warms up, we continue to enjoy outside play time. May also brings the transition into end of the year activities. There are songs to learn and crafts to be made. May is here and the 4's are busy preparing their Mother’s Day surprises that they will present to their mom during our special Mother’s Day celebration. The children are keeping their gifts a “secret” and you can hear them giggle when they tell mommy that they have a surprise for them! Our caterpillars are here and the children are intently observing and recording their changes and development. Each morning the children enjoy noticing how the caterpillars have grown and they look forward to seeing them form into a chrysalis and then emerge as a butterfly. Our butterfly study will lead into a Bug Unit. Children will show their imaginative side when they create and name their own bug. The 4’s will make a tee shirt with every child and teacher’s handprint on it. This tee shirt will be worn during a class trip in June and the shirt will be a fond memory of their friends and teachers at NNS. Our journal entries continue documenting our growth during the year. Towards the end of the month, the 4’s will be concentrating on preparing for their graduation day. 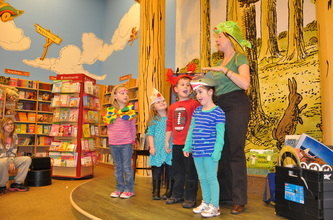 NNS families enjoyed crafts, face painting, and story time with children's books author Alison Formento at Barnes & Noble. 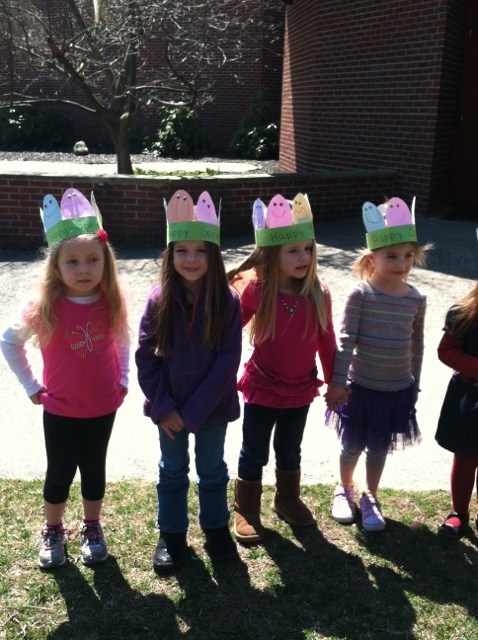 Spring has sprung at NNS! 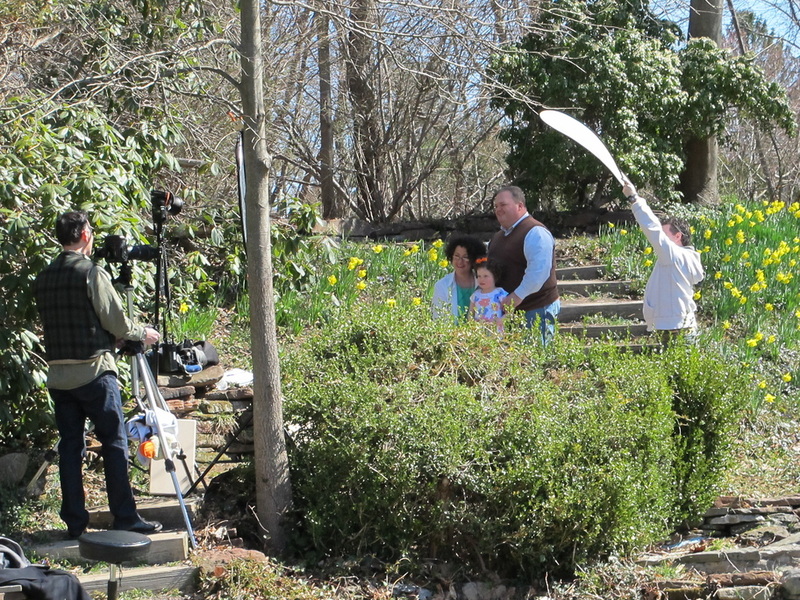 The daffodils came into full bloom just in time for our Family Photo Day and the Spring Hat Parade. The 2's are having a lot of fun learning their colors. Shapes is a major theme that will be introduced in the month of April. At craft time, the children will create a shape poster. Group discussion and special games will make learning shapes fun. We will be singing the Five Little Ducks at circle time to help build early math skills. At the end of the month, the 2's will be begin working on their surprise plans for their Mother's Day Celebration! 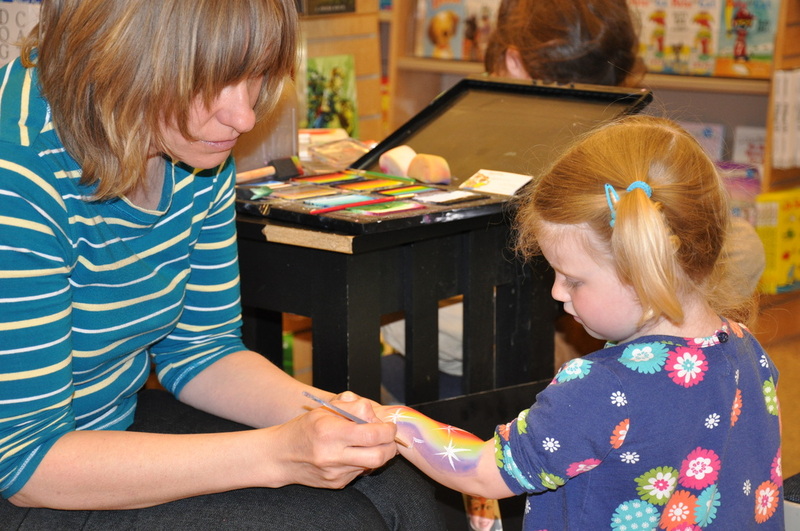 It is starting to feel like spring, and the 3's are busy creating beautiful crafts for the new season. 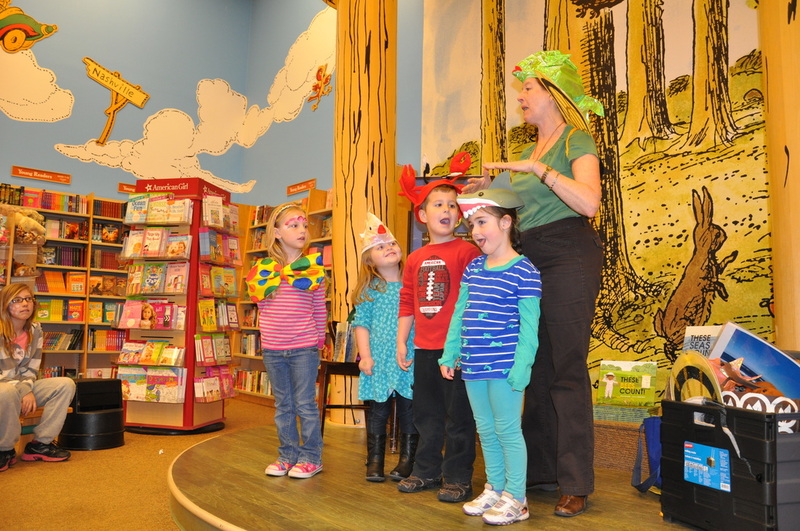 April will begin with our annual "Spring Hat Parade" followed by a special spring snack. The Dinosaur unit has been completed. We are now studying Bugs! 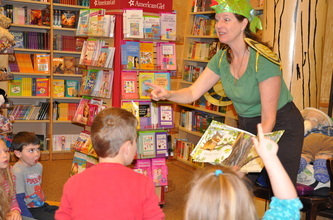 The children will celebrate Earth Day and discuss ways they can help make their planet "greener." The Mobile My Gym program will end mid-month; the 3's have had a great time learning new physical skills. As the weather warms up, it will be wonderful to have more outside time. 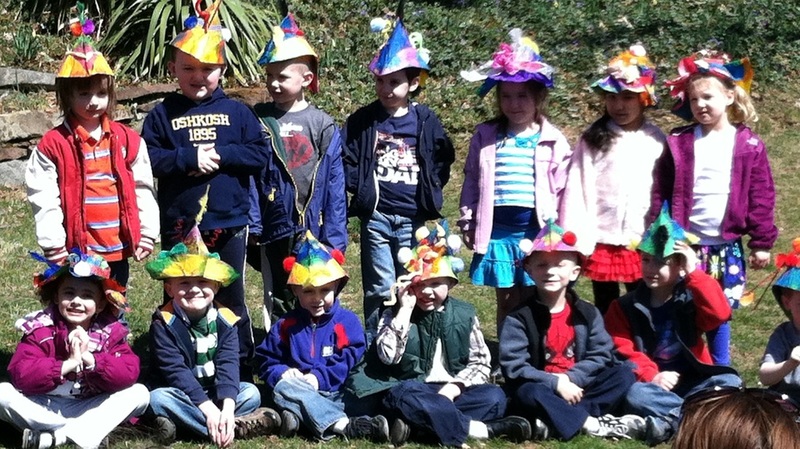 Spring is in the air as the children create their beautiful hats for their "Spring Hat Parade." They will go on a special walk to observe the changes that are happening outside and will work on a mural depicting the signs of spring. 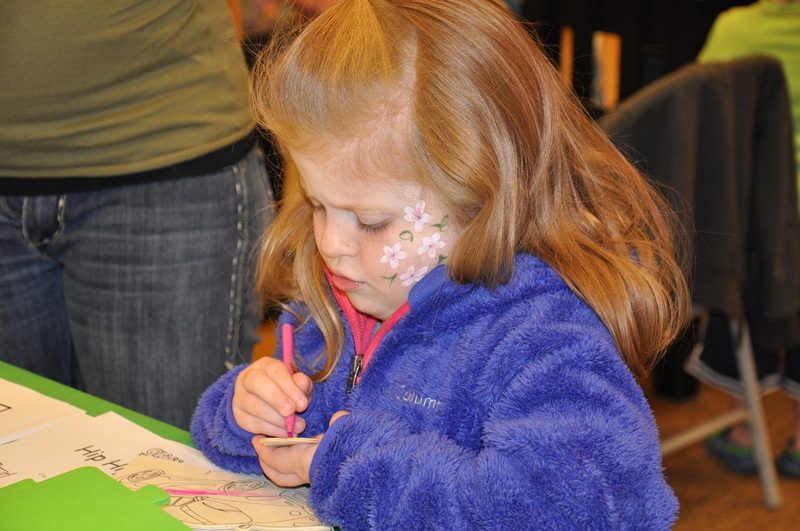 Discussions of what spring brings include the birth of animals, plants growing and the change in our weather. Earth Day will include lessons on the meaning of reduce, reuse and recycle. Journal writing continues to increase their literacy. The 4's are really looking forward to the warmer weather!! 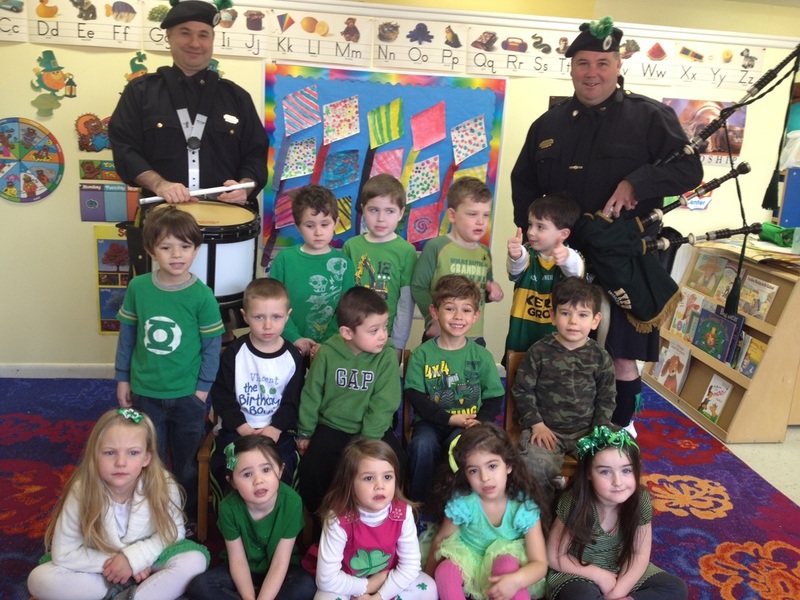 NNS dads, Chris Green and Mike Brennan, surprised the 4's morning classes with a bag pipe and drum performance on their Green Day! They are pictured below with Miss Bette's class. Thanks, Dads! Welcome to March in the 2's! It is time for our weekly color segment. We start off with red, then blue, followed by brown, then orange and green, and finally, yellow and purple! Each new color will have a unique craft. At circle time we will play with our color box. This month, we will read The Three Little Pigs. The children will have a party to celebrate St. Patrick's Day and there will be an Egg Hunt before our Spring Break. Spring is in the air and the 3's are excited! We are getting ready for our town's favorite holiday - St. Patrick's Day. The children are also creating various crafts for Easter and Passover, making baskets for our Egg Hunt and hats for our Spring Hat Parade. We have extended our dinosaur theme because the children have enjoyed learning about these creatures so much. Everything is popping up "green" in the 4's. 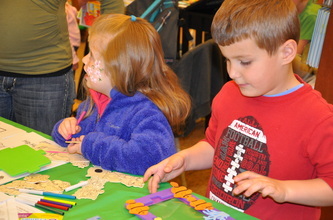 The children are busy painting shamrocks and leprechauns and they are learning about the Emerald Isle of Ireland. They will celebrate the birthday of Dr. Seuss by having a pajama day, reading some of his famous books, and making a meal of "Green Eggs and Ham." The 4's are continuing their theme of dinosaurs and are learning new vocabulary words such as, extinct, enormous, ancient, fossils, herbivores and carnivores. They painted a dinosaur mural and it is displayed in the hall. 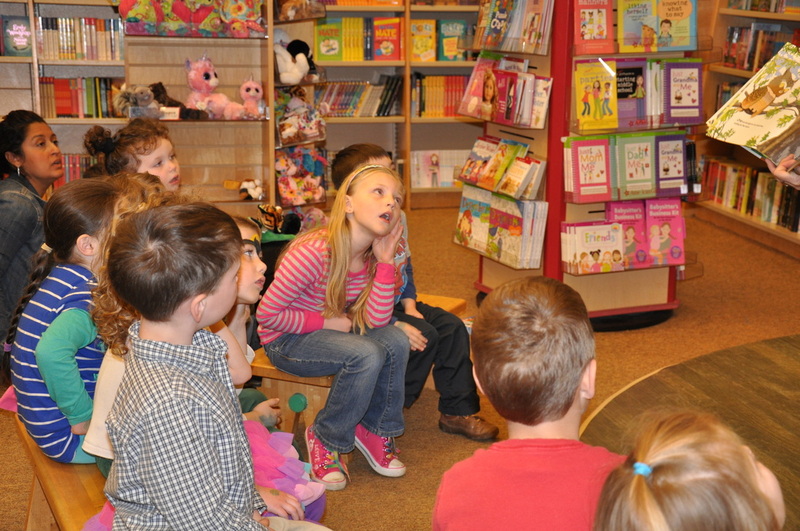 The children are learning the phrase "March comes in like a lion and out like a lamb." During craft-time, they will make lions and lambs that will be displayed in their classroom. The children are noticing the changes that are beginning in nature outside. They are looking forward to spring and spending more time outside. The end of March will find the 4's coloring hard-boiled eggs and making a special spring craft.